Everyone wants to know how to stop dogs from shedding, but the sad truth is that it can't be done. You'll never be able to completely remove every loose hair, and even if you could, more would grow in its place. The good news for dog owners is that there are ways to help drastically reduce shedding, and the easiest of those is by using a deshedding tool. Pet deshedding tools can reduce the amount of loose hair that your dog sheds by up to 90%. No amount of bathing or dietary supplements will give you those results. Regular grooming with any of those tools is the only way to save your furniture, carpets and clothing from being overrun with dog hair. Specially made dog deshedding tools are very common. They can be found in any pet store, and you'll usually find a variety to choose from. Some are better than others. 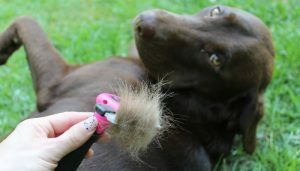 Manufacturers make brush-like dog deshedding tools for different coat types and lengths, along with tools for different sizes of dogs. They aren't all made equally, so be sure to do a little research before making your selection (or check this round-up for more tips on what to pick). You need to select a deshedding tool that will meet your dog's individual needs. As I explain in my video guide above, if your pooch has a double coat, wiry fur or long locks, you need to buy a shedding tool that is specifically designed for that coat type. Also, make sure that you're buying a product that is safe, not just effective. I recommend shopping around online first, even if you prefer to buy your products in a local store. Research the right product for your dog, read customer reviews and visit the manufacturers website. When you find the right shedding tool for your pet, you can stop into your local pet store and pick one up. When learning how to stop dogs from shedding, you have to understand that deshedding tools aren't going to do all the work. The tool is of huge help, but you'll need to use it properly; otherwise you won't get the results you're anticipating. Most of the poor reviews that these products receive are simply due to pet owners who don't read the instructions or don't get the right type of dog brush. The best time to use a deshedding tool for dogs is after a bath. Washing your dog releases a lot of the loose fur that is stuck in his coat. DO NOT brush your dog when his coat is still wet! Make sure his coat is 100% dry before brushing him with a deshedding tool. You also want to make sure you give your dog a brush through with his regular grooming brush. A pin and bristle brush will work for most dogs. This is to ensure that there are no mats or tangles in his coat. I mention this in my video, as it is very important! Have you ever pulled a brush through your hair and caught a tangle that you didn't know was there? It pulls on your hair and it really hurts! That's the pain that you'll inflict on your poor pooch if you try to get the mats and tangles out of his hair with a deshedding tool. That is not what these tools are made for! The last thing you need to do to prepare your dog for deshedding is to give him a thorough inspection. Go through his coat with your hands and remove any foreign objects, like burrs, that you may have missed. Check his skin for lumps, scratches or any other wounds. If a deshedding tool for dogs catches one of these lesions it will be extremely painful for your pup. As you'll see in my video about how to stop dogs from shedding, you're going to need to brush your dog in the same direction of his fur. Basically, you want to brush from head to tail with long strokes. Stop to remove the hair as needed when the teeth get full. DO NOT press down on the brush. Deshedding tools for dogs are equipped with a stainless steel head that has a row of sharp teeth. These teeth are great for collecting loose hair, but if you press them into your dog's skin they could cut him. 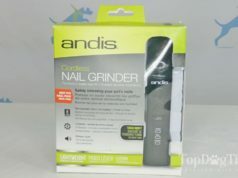 These tools are designed to reach deep into your pet's coat to remove any debris or loose hair that is buried underneath the top coat – you don't need to force it. The amount of time that you spend brushing your dog will vary depending on his coat type. As you'll notice in my video, our chocolate Labrador requires a lot of brushing. I typically brush her for about 15-20 minutes every day, but in the spring when she is shedding excessively it can take up to an hour to thoroughly brush through her coat. Really, you'll want to continue brushing until you're not getting any more fur in the brush. This is the only way to reduce your dog's shedding. Of course, any amount of brushing will help. After all, whatever fur you do manage to remove from your dog is that much less that you will have to clean up around your home. If you want to know how to stop dogs from shedding, the key is to brush until the deshedding tool doesn't pick up anymore fur. It will take a while in the beginning, but if you make brushing a daily event you'll be shaving time off the task after the first few days. Just remember to stay consistent or the loose hair will begin collecting and you'll be back to brushing for an hour or more. DakPets vs. Furminator Reviews – Which One's Better? In my video above I mention that I like to deshed my dogs outside as opposed to indoors. That's because I don't have to clean up the mess afterwards. If you're able to groom your dog outside, I highly recommend it, but if not make sure you do it somewhere that is going to be easy to clean afterwards. There will be a lot of hair floating around, even if you put the clumps of fur right in the trash can. There is still dog hair flying around every time you make a pass down your pet's back. You really shouldn't brush your dog in a carpeted area. Try to do it on a hard floor that will be easy to sweep up when you're done. You'll also want to make sure that you clean the teeth regularly as you're brushing. If the teeth are full they won't be able to collect anymore hair, essentially defeating the purpose of every stroke that you take. The more you clean the brush head, the more hair you're be able to remove. When you're finished deshedding your dog, wash the brush head with warm water and a mild soap. Your dog's skin makes natural oils that are great for the condition of his coat, but they'll build up on your deshedding tool over time. Still confused about picking the right tools? If you're unsure which deshedding tool for dogs to buy, here's a great comparison article I've done a while ago (including a video review). Take a look to see how I use them and which ones are best for the job.